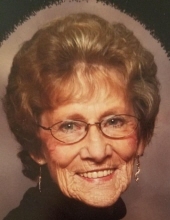 Leona Fay Robinson, 77, of De Soto, KS passed away on February 5, 2019. Funeral services will be held on February 11, 2019 at 11:00AM with visitation one hour prior at Cedar Crest Memorial Chapel, 32665 Lexington Ave., De Soto, KS 66018. Leona was born February 18, 1941 in Oklahoma. She graduated from High School in Riverton, KS. Leona married Calvin Robinson on November 19, 1959 and they moved to the De Soto area in 1960. Leona worked at the Sunflower Army Ammunition Plant for over 30 years before retiring. She belonged to the Teamsters. She enjoyed being a Girl Scout leader and Boy Scout leader. Leona also enjoyed the Kaw Valley Sportsmen Club, she attended every event with Calvin. She was a loving mom and grandma and she will be missed by all. Preceded in death by: husband Calvin Robinson; parents Arlis Loy and Edith Ball; 4 brothers and 2 sisters. To plant a tree in memory of Leona F. Robinson, please visit our Tribute Store. "Email Address" would like to share the life celebration of Leona F. Robinson. Click on the "link" to go to share a favorite memory or leave a condolence message for the family.